The Best Ways to use British Airways Avios for Multi-Continent trips with LOW Fees! British Airways Avios are know for their ridiculous fees and taxes and it usually doesn’t make sense to redeem them for coach trips. For example, you will pay $500 in fees for a coach award to Europe from the US on British Airways. However, there are 3 types of long distance flights for which you will pay NO or LOW fees. 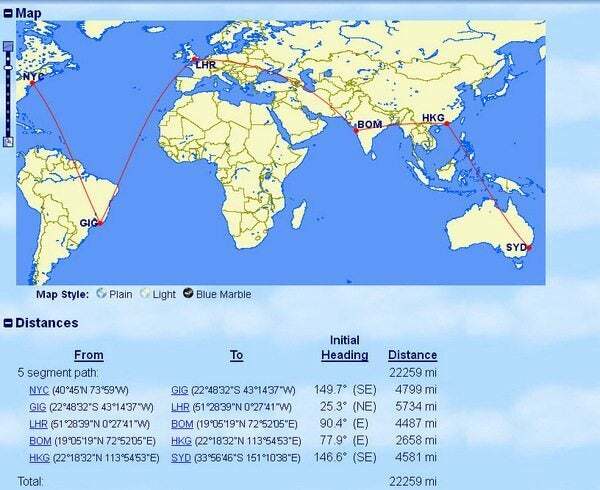 And all but 1 of these routes below cost less than $500 or 1 transatlantic redemption from the US to Euope in coach. All the itineraries in this post are priced in coach to show how you can have lots of travel across 3 to 4 continents in coach for only a few hundred dollars in fees using British Airways Avios. The conventional wisdom is that Avios is not a good choice for long distance coach itineraries, but that is not always true. Some of you don’t want to travel 30+ hours in coach, and that’s fine. But lots of other folks will think it great to be able to visit Brazil, the UK, and Ireland for 67,500 Avios + ~$175! That’s only 45,000 American Express Membership Rewards points in coach and 90,000 Membership Rewards Points in Business Class if you take advantage of the 50% transfer bonus to British Airways until May 31, 2012. Wouldn’t that be a great 2 week (or month!) vacation? 1. 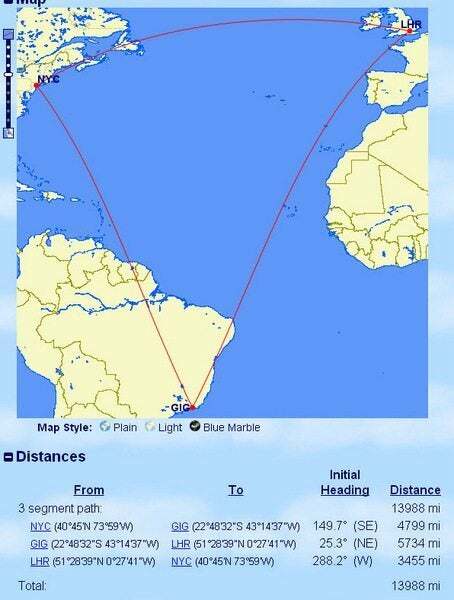 Flights from the US to South America. Many folks know that you don’t pay fuel surcharges when using British Airways flights from the US to South America on American Airlines or LAN. For example, it costs only 25,000 Avios and $23.70 to fly from New York, Dallas, or Miami to Rio de Janerio on American Airlines. But you will have to pay more Avios to get from your airport to the departure city or use a different routing since each extra Avios segment costs more based on the distance flown. What is much less know, is that you pay very little fuel surcharges (~$150 roundtrip) for flights on Aer Lingus, a British Airways partner airline, from the US to Dublin and back. Even better, there are often 9 or more seats available in coach on the Boston and New York JFK flights. It was harder finding award seats on the Chicago and Orlando flights. One Mile at a Time has a nice post on how to find availability using either the Qantas website (free) or ExpertFlyer (paid service). The fees are a bit higher returning, but still much less than what you’ll pay on a British Airways flight. You can’t book these online so you’ll have to pay a $25 telephone booking fee. Lucky also reports finding lots of business class seats when using the United website to search for Aer Lingus award availability. These flights are perhaps one of the best ways to visit Europe using Avios points because of the low fees. 25,000 Avios roundtrip in coach or 50,000 points roundtrip in business + $150 is a steal for travel to Europe! What is even less known is that you don’t pay ANY fuel surcharges when you use Avios for flights leaving Brazil on Iberia or British Airways thanks to Brazilian law. This means that 1-way or return trips originating from Brazil have virtually no fees. 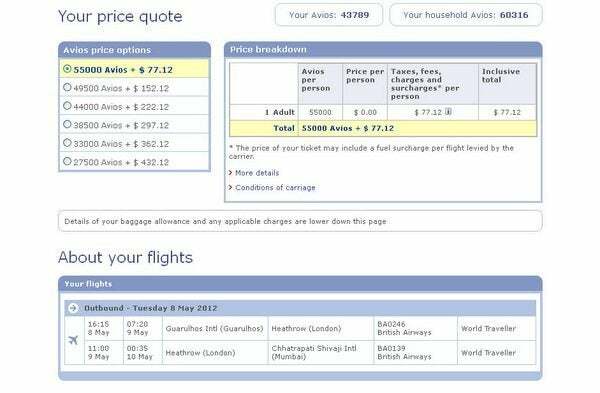 For example, you can fly from Brazil to London for only 30,000 Avios & $36 in fees. 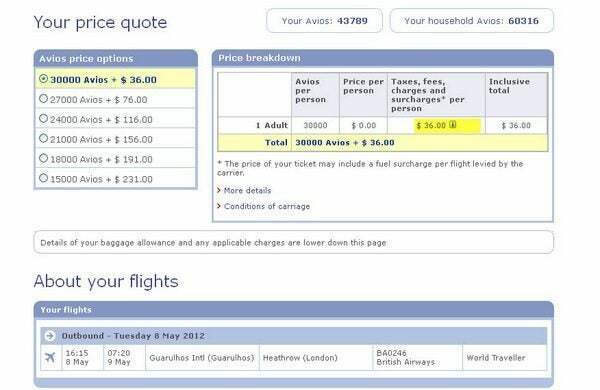 Compare this to the $242 in fees it costs to fly from Seattle to London. British Airways flies to London from the following Brazilian cities and has good availability from both cities. At first, this seems useful only to folks based in Brazil or for US readers with family in Brazil. But piecing together all 3 types of long-haul flights with no or low fuel surcharges you can use British Airways Avios to have Big Travel with Small Money across multiple continents! The taxes and fees will remain about the same in Business or First Class unless you have a stopover in London, in which case add on ~$300 for the premium departure tax from London. Note that you will have to get to the origin city on your own or by spending Avios and for some of the longer itineraries, you will have to either buy a 1-way cash ticket back or use miles on United or American Airlines for a 1-way award ticket to return to the US. British Airways Avios doesn’t give you any routing flexibility (i.e. the best value flights are out of only certain cities), and unless you’re willing to pay more points, these itineraries won’t be perfect. Avios, more than any other mile and points currency, requires flexibility. And the itineries below are creative ways to squeeze value out of your Avios. You can book the itineraries below as separate 1-way awards and all awards except for Aer Lingus awards can be booked online. Also note that US Citizens have to pay ~$160 for a 10 year Brazilian visa. You also CANNOT use the Travel Together companion pass after spending $30,000 on the Chase British Airways credit card for these itineraries. That’s because you have to fly only on British Airways planes AND leave and return from the US. By traveling back to the US from Dublin, you save on the London departure tax and you don’t pay high surcharges on British Airways flights. However, you’ll have to buy a cheap ~$150 ticket from London to Dublin or Shannon. But you’ll visit Brazil and Europe for only 67,500 Avios and $175! Note that you may have to pay more to get from the departure and arrival cities to your home airport since you pay more for each extra segment when using Avios points. Flying back to the US from London on British Airways increases the cost of the trip because of BA surcharges and the departure tax from London. But you’ll get a lot more award availability on British Airways flights and can fly back to over 22 US cities. This will cost you only 50,000 Membership Rewards points in coach or 100,000 Membership Rewards points in Business Class if you take advantage of the 50% transfer bonus to British Airways until May 31, 2012. To put this in perspective it costs 60,000 United, US Air, or American Airlines miles to fly to Europe. For just 15,000 more Avios (and a few hundred dollars more), you can also visit Brazil! Note that you may have to pay more to get from the departure and arrival cities to your home airport since you pay more for each extra segment when using Avios points, but this may be less because British Airways flies to so many US cities. You can use this itinery to visit any city in Europe (Paris in the above example) by connecting via London, and can also have a stopover in London. Substitute Paris in the above example with any other European city. Note that you may pay more Avios depending on which European city you visit. However, you will have to buy a ticket from that European city (Paris in the above example) back to Dublin or Shannon to return to the US. This costs only 48,000 Membership Rewards points in coach or 96,000 Membership Rewards points in Business Class if you take advantage of the 50% transfer bonus to British Airways until May 31, 2012. This costs only 56,000 Membership Rewards points in coach or 112,000 Membership Rewards points in Business Class if you take advantage of the 50% transfer bonus to British Airways until May 31, 2012. In this example you get a stop-over in Paris AND in London. 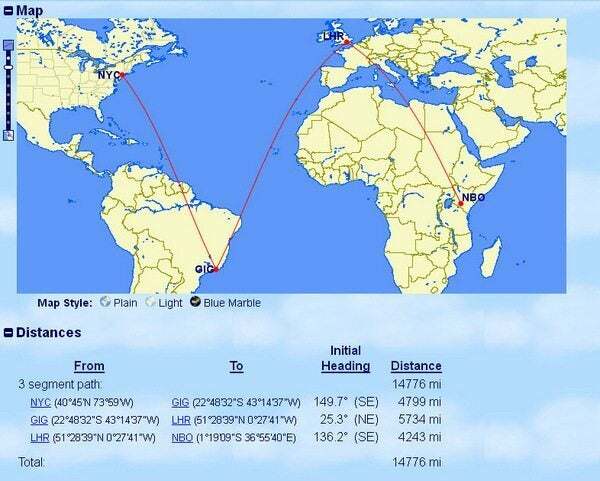 You can fly from Brazil to any European city (Paris in this example) via London. 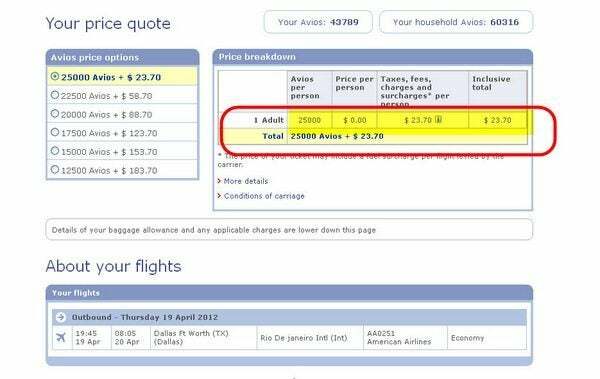 You may pay more Avios depending on which city you visit. This costs only 48,000 Membership Rewards points in coach or 112,000 Membership Rewards points in Business Class if you take advantage of the 50% transfer bonus to British Airways until May 31, 2012. The itineraries below will let you visit at least 3 different continents for very little cash outlay. However, you will need to either buy a separate 1-way ticket to return to the US, or use United or American Airlines miles for a coach award ticket back to the US (less than 40,000 miles United or American Airlines miles). You can transfer Chase Ultimate Rewards points to United and Starwood points to American Airlines. You don’t necessarily need to visit Hong Kong, but could visit any of British Airways’ Far East destinations using this itinerary. That’s 3 continents and 16,000 miles of flying for only 85,000 Avios! In this example, you travel to Brazil, and have stop overs in London and Hong Kong. That’s only 56,666 Membership Reward points in coach and 113,000 Membership Rewards points in Business Class using the 50% transfer bonus. Of course, you’ll have to get back to the US from Hong Kong, but you’re better of using 32,500 United or 35,000 American Airline miles to get back to the US from Hong Kong to avoid paying fuel surcharges if you use your Avios points. 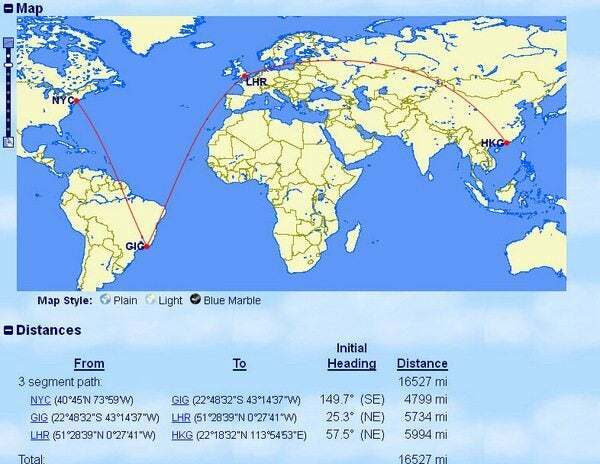 In this example, you travel to Brazil, and have stop overs in London, Beijing and Tokyo for ~17,000 miles of flying. This will cost 60,000 AMEX Membership Rewards points in coach and 120,000 points in Business Class after taking advantage of the 50% transfer bonus. 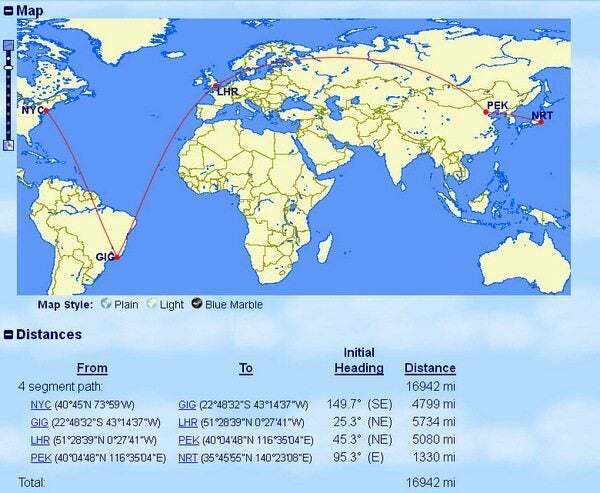 In this example, you travel to Brazil, and have stop overs in London, Beijing and Hong Kong. Of course, you’ll have to get back to the US from Hong Kong, but you’re better off using 32,500 United or 35,000 American Airline miles to get back to the US from Hong Kong to avoid paying fuel surcharges if you use your Avios points. That’s only 60,000 Membership Reward points in coach and 120,000 Membership Rewards points in Business Class using the 50% transfer bonus. In this example, you travel to Brazil, and have stop overs in London, Dubai (substitute for other British Airways Middle East destinations) and Hong Kong. That’s only 63,333 Membership Reward points in coach and 126,000 Membership Rewards points in Business Class using the 50% transfer bonus. 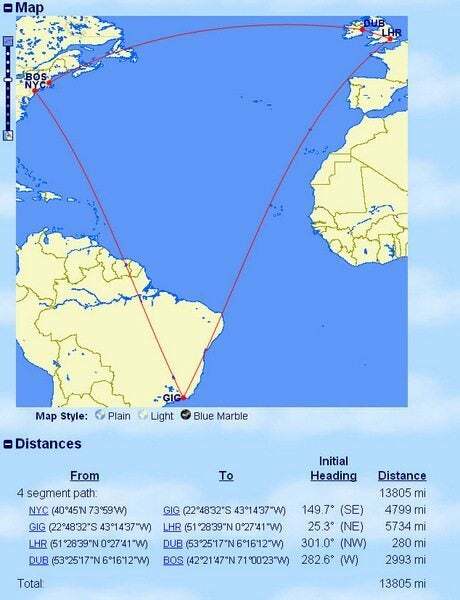 In this itinerary you can have stop overs in Brazil, London, and Nairobi (substitute for other British Airways African destinations). That’s only 53,333 AMEX Membership Rewards points in coach and 106,000 points in Business Class after taking advantage of the 50% transfer bonus. Of course, you’ll have to get back to the US from Africa, but you’re better off using 40,000 United or 37,500 American Airline miles for a 1-way award back to the US from Africa to avoid paying fuel surcharges when using Avios points. If you do use American Airlines miles, you may have to travel via London and can’t avoid paying $250 on at least 1 segment on British Airways. Or you could buy a 1-way ticket back. In this itinerary you can have stop overs in Brazil, London, and Mumbai (substitute for other British Airways Indian destinations). Of course, you’ll have to get back to the US from India, but you’re better off using 40,000 United or 45,000 American Airline miles for a 1-way award back to the US from Hong Kong to avoid paying fuel surcharges when using Avios points. Or you could buy a 1-way ticket back. That’s only 53,333 Membership Reward points in coach and 106,666 Membership Rewards points in Business Class using the 50% transfer bonus. In this itinerary you can have stop overs in Brazil, London, Mumbai and Bangkok (substitute for other British Airways African destinations). Of course, you’ll have to get back to the US from Bangkok, but you’re better off using 32,500 United or 35,000 American Airline miles to get back to the US from Hong Kong to avoid paying fuel surcharges if you use your Avios points. Or you could buy a 1-way ticket back. 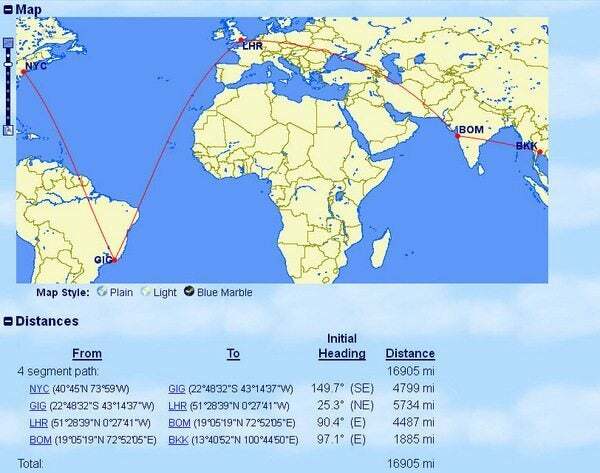 In this itinerary you can have stop overs in Brazil, London, Mumbai, and Hong Kong (substitute for other British Airways African destinations). This will cost 61,666 AMEX Membership Rewards points in coach and 123,000 points in Business Class after taking advantage of the 50% transfer bonus. Of course, you’ll have to get back to the US from Hong Kong, but you’re better off using 32,500 United or 35,000 American Airline miles to get back to the US from Hong Kong to avoid paying fuel surcharges if you use your Avios points. Or you could buy a 1-way ticket back. This will cost 78,333 AMEX Membership Rewards points in coach and 156,666 points in Business Class after taking advantage of the 50% transfer bonus. Bottom Line: There are ways to use Avios for travel in long-distance coach and business class for very little in taxes and fees! Please comment if you have any questions and I’ll either reply or write another post on the topic. My husband has 150,000 Avios and I have 109,000 AA miles. We want to take our daughter to Australia (Adelaide) in December/January 2015. We can’t seem to find the information that tells us the best route to use for the least amount of points. What do you think? Can I book it via BA on phone for only $25 versus online? $160 Rio VISA is a bummer. I am having 17000 Avios to my credit and the same number are credit on my wife’s name. I would like to use this for my travel from Mumbai to London and return by British Airways. 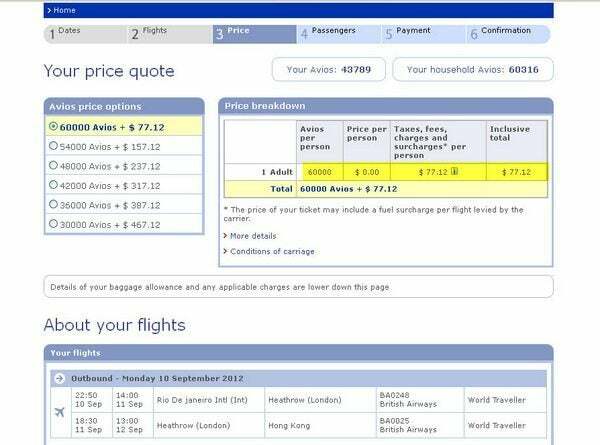 Where can I get Avios calculation for my trips ? How much I have to pay in cash after redeeming my Avios ? We need to fly from Scotland to Bangkok or Kuala Lumpur. What is the best way to use our avios? Should we break up our journey via Dubai or India or fly from Scotland to another European airport rather than from London. Or is it better to use the Avios to upgrade? Looking to travel mid Oct 14. Hello Hope you can help me on this one.